iOS, Android ProPTT2 Applications are available on App Store and Google Play Store. Download ProPTT2 and enjoy professional video/voice Push-To-Talk service. * Please note iOS version supporting is paused by iOS's technical issue. Some low-spec devices may not be supported. Communicate with users in a same channel using video and voice. Video sender can choose various camera settings such as zoom-in, zoom-out, flash, or switching. depending on device specifications or network status. You can add ProPTT2 widget on your smartphone homescreen for a quick Push-To-Talk. You can use VOX which PTT automatically start transmitting when you speak so you can use ProPTT2 hands-free. On the Chat, you can use speech recognition which identify what you speak and convert them to text. Connected Network quality and When sending and receiving PTT, the network/audio state are displayed as a graph. "Invite friends to your own channel you created. Select a friend and send/receive Push-To-Talk messages on the 1:1 channel." 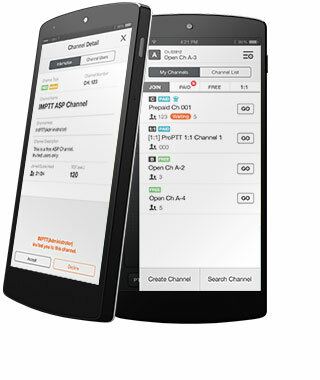 On [Channel List], subscribed/invited channels lists are displayed.To connect to the channel, just touch the [join] button. On [channel information] screen, you could view detailed information, subsribers and currently joined users. Make your own channel and invite users on your friend lists or send SMS/email invitation message. Search other user's channels and subscribe to channels you want. On friend lists, added users are displayed. Select a friend and invite to your channel. You can see friend's profile or see whether your friend is online or not. It's possible to search who's using ProPTT2 and send friend request to them. Recommend ProPTT2 app to others via SMS/email/Facebook.